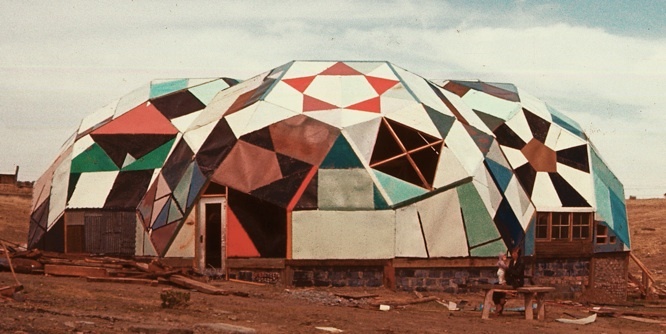 Drop City was the first rural commune of the '60s where a group of about 12 adults and children lived in dome-style architectures inspired by the geodesic design principles of Buckminster Fuller. House-domes were built without a systematic kit or an exact design and members of the commune used mostly inexpensive, found materials such as sheet metal hacked off of junked car roofs. The village became a sort of laboratory for experimental building, solar technology and recycled materials, becoming an inspiration for a new generation of DIYers. Influenced by Allen Kaprow's "happenings" and new theories and performances by John Cage, Buckminster Fuller, and Robert Rauschenberg at Black Mountain College, they were determined to break art out of the confines of museums and galleries and integrate it with everyday life. To create a “live-in” work of Drop Art, they founded Drop City”. They used the geodesic design principles to build domes for domestic living, using waste and salvaged material.